Maybe because the golden rule was the rule of law in my childhood home, heaven and hell made less sense to me than the idea that at our life’s end, our soul would be momentarily shattered by a karma bomb. It would be one thing to be presented a list by St. Peter, another to realize fully who we’ve been and how our actions hold up. Every piece of a karma bomb’s brilliant shrapnel would fill us with an empathic experience that would help us vividly understand the joy and pain we inflicted on others during our lifetime. This belief has been a salve I’ve used on my ego in painful situations, particularly when I’ve needed to accept defeat or, really, reality. It was there when I needed a way to cope with feelings of powerlessness in the face of infinity, or, more often, in the face of one of the world’s big mean jerks. I sometimes went so far as to let it keep me from promoting or defending myself, instead thinking that this cosmic force was going to somehow let the real me, my real intentions, be seen, appreciated, and especially understood by whoever was that I needed to have understand it. 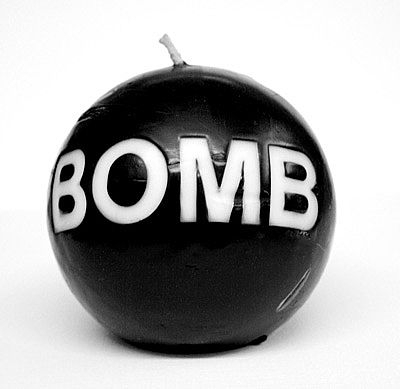 I’ve spent too many wee hours searching for the components to construct my own small karma bombs – usually words. I’ve searched for some kind of truth in language that I hoped would suddenly bring another person to a full-bodied understanding of how their mistreatment of me, or worse, of someone I care about, truly felt. It would let them know all about the parts of the story they don’t know, or fail to look at, powerfully and instantly. And for all of that time I’ve spent laboring, these letters are largely unwritten and unsent. Some of my journalistic peers say things like “our readers aren’t interested in reading about X,” because they have marketing data that they’ve come to trust beyond their own, far less limiting, human instincts. And X is almost always something that illuminates a social concern, something that asks the reader to consider life outside of themselves. I’ve seethed over our lack of faith in people. I have heard morally questionable actions repeatedly excused with “it’s only business.” I’ve also seethed over this regularly in my karma bomb-making quarters, because in my mind, business doesn’t get to exist without people. Business is people. Period. But I’m guilty of trapping ideas about other people under glass myself. Once we grouse about a friend or family member or colleague as thoughtless or incapable or difficult or uncaring, it’s hard to back off of that precipice and learn to see them any other way. The late Randy Pausch has a simple-sounding remedy for this in his Last Lecture — he basically says that every person has a good side, we just have to wait for them to show it to us. And that good side is always, always worth seeing. I believe that, whether or not I can find the patience or the time or the desire to do the searching that uncovering that thing may require. The more I’ve learned about karma, the more it’s come to mean something else to me… something that’s not about righteousness or judgment or berating myself for being passive or mentally bombing people with my version of reality. My karma is what I do with it. It’s about being loving, taking responsibility for my own actions, sowing what good I can in the world and seeing people if not for what they are, for the way that they ask me to see them, if only just to know what that might be. My karma bombs are useless on everybody but me. Or maybe everybody, including me. What about you? Do you make them? By now, you’ve probably guessed that this is little more than a pointed pep talk meant to help me convince myself to stop mentally swearing at bullies, editors, politicians, queen bees, unpaid bills, the life I thought I deserved and mosquitoes so often. Now back to deep-fried garlic mashed potatoes on a stick. BuddhismkarmamantrasspiritualityWhat the hell are you talking about? My version of karma bombing is the idea that through good acts we can heal the world (tikkun olan), which is a Jewish thing. Wish I was better at healing the world though. I’m working on it. Hope writing your pep talk helped; reading it did! I google shared it, too, figuring I’m not the only one who should benefit from your bomb! Reading this post and dawn’s comment further affirms for me that the world’s religions aren’t that different. Like you, I knew and had faith in karma before I knew it was a word. I love the concept so much, I named my child after it (though I don’t often share that online!). I find that life often distracts me from remembering what I’m here for – how’s that for a conundrum?! Great post – very thoughtful. Thanks.